We in the State of Wisconsin got our first taste of Governor Scott Walker’s governing style when, before he was even sworn in, he began telling his predecessor, the outgoing Governor Doyle, what to do; and when he held a private swearing-in ceremony for himself and a few close campaign donors two days before his actual inauguration. His most controversial act, and the one which stirred the most outrage, was his bill to cut the state’s deficit by cutting the salaries of state employees, reducing their benefits, and stripping their union of the power to bargain for anything besides wages. The Unions actually were willing to accept the cuts, but that wasn’t good enough; only total capitulation would satisfy the Governor. Fourteen Democratic state senators fled the state in order to prevent Walker from having a quorum to ram his bill through. He did anyway, by performing a procedural end-run around them; but in the interim, citizens from all over the state came to the Capitol to protest the Governor’s actions. That summer, citizens opposed to Walker petitioned to hold recall elections for several of the state legislators who voted for Walker’s bill. Four of the six recalls were successful. 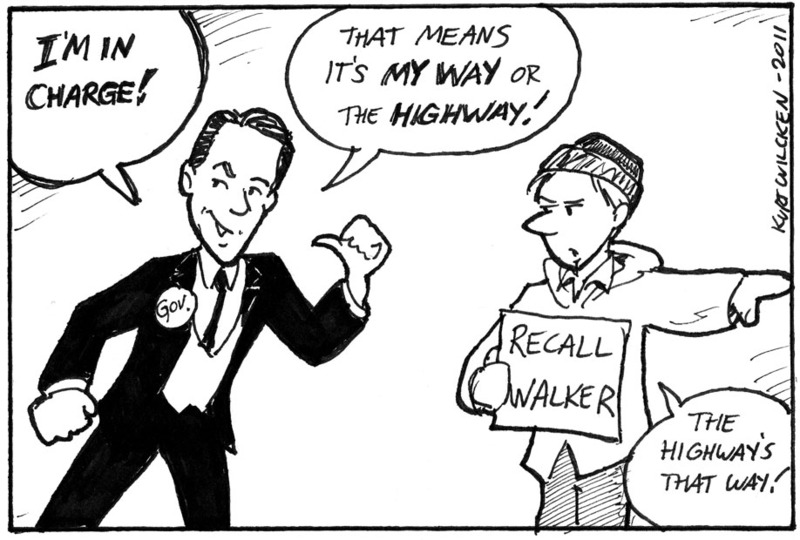 Walker himself was not eligible for recall at the time because under Wisconsin law an elected official cannot be recalled until he has served a year in office. On November 15, 2011 the petitions began to circulate.